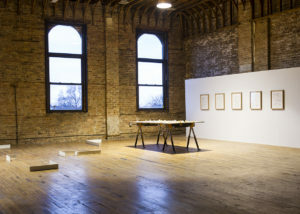 FSU Art Assistant Professor, Julietta Cheung’s exhibition opened at Ballroom Projects in Chicago April 2nd. Cheung’s exhibition, “Prospects,” consists of three multi-part projects: “If, And, Or, Nor, But” (2015), “Prophetic Compositions” (2015), and “Elinors” (2015). The project, “If, And, Or, Nor, But” is a series of 3D-printed fictional joinery hardware that is the outcome of Cheung’s FYAP grant from FSU. A part of “Prophetic Compositions” was first shown at the Faculty exhibition here at MoFA in January and the entire series of five works is shown at Ballroom Projects. Both of these projects explore our notions about the future. Cheung began her project “Elinors” in late 2014. It is a series of discreet sculptural installations loosely based on Jane Austen’s 1811 novel, Sense and Sensibility. 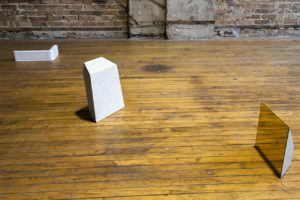 Cheung’s project deals with questions about the Self and Other through the viewer’s relationship to sculptural objects in specific spatial configurations. “Prospects” is on view until April 23rd.